Alaska Northwest Books, 9780882405711, 64pp. Sam is an eight-year-old boy who's always on the lookout for adventure in his corner of the Alaska wilderness. Sometimes Sam's explorations get him into a scrape--most times he learns something new. In the second book of this exciting series, Sam is building a driftwood fort on the beach when he hears a strange cry, like a baby, echoing off the water. It is a baby--an abandoned baby sea otter. Sam is determined to help take care of the pup through the night so a biologist can take over when the ferry arrives. And what a night it is Early chapter-book readers will delight in Sam's bizarre babysitting experience, and celebrate the satisfying outcome of a rescued wild animal that finds a new home in the Alaska Zoo. 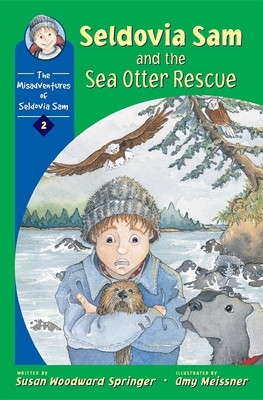 Seldovia Sam and the Sea Otter Rescue won the ASPCA Henry Bergh Children's Book Award. Susan Woodward Springer grew up in a fishing village on the coast of Maine. She attended college in Maine and Vermont, and moved to Alaska in 1985 where she developed the series, The Misadventures of Seldovia Sam. She loves the outdoors and spent many years exploring the backcountry around the real town of Seldovia, Alaska before relocating back to the continental United States. Her previous publications include "Seldovia, Alaska: An Historical Portrait of Life in Herring Bay" (Blue Willow, Ind. 1997). And an environmental education color book commission in 1995 by Alyeska Pipeline Co. Her text and interactive pen pal program featuring Alaska schools, titled "Alaska...Pure Poetry, "is part of Alyeska's environmental education program and was selected by the Smithsonian Museum gift shop to complement the Alaska Pipeline exhibit. A portion of the author's proceeds from The Misadventures of Seldovia Sam have been earmarked for the Alaska Children's Trust. Susan Woodward Springer, an artist and writer currently lives in Boulder, Colorado. Amy Meissner completed her undergraduate degrees in art and textiles in Nevada and spent several years as a clothing designer in the United States and Canada. Amy received a Master of Fine Arts in Creative Writing at the University of Alaska Anchorage, while focusing on her artwork in her spare time. Besides her existing illustrations in the expanding series entitled, The Misadventures of Seldovia Sam, she has illustrated three other children's books. Amy Meissner currently lives and works in Anchorage, Alaska. Her two, bad orange cats keep her company in the studio all day long where she paints, draws, writes, cuts fabric, and moves cats off the things they aren't supposed to sleep on.